Have you ever stopped to think about what a seed really is? Underneath it’s husk, that teeny tiny darling contains all of the nutrients it needs to initiate the rapid cell division and biochemical processes required to make a plant. That’s impressive! In their dried ‘seed’ state, the majority of these micro-and macronutrients are stored away, just biding their time in dormancy. However, germination triggers a quick transformation whereby all of the vitamins, minerals, proteins, and essential fatty acids begin to multiply. And multiply. And multiply. Most people consume seeds (nuts, grains, legumes) that are in a hibernation phase – either raw or cooked – when their nutrients are locked up tight by deactivators such as phytic acid and other enzyme inhibitors. These dormant seeds are more difficult to digest and can block nutrient absorption and uptake. In order to maximize the nourishing potential of seeds (nuts, grains, legumes), we need to unlock them with a simple and common-sense key: give them life. Allow them to grow, and they will repay you in spades. So, what exactly happens? Initially, germination produces vitamin C while increasing carotene, vitamin E, and B-vitamins like riboflavin. Sprouting turns a seed from an acid-forming food into an alkalinizing food, which is essential for proper pH balance. Living sprouts carry with them a powerhouse of enzymes that aid in digestion and other metabolic functions. Sprouting causes protein content to rise while fat content drops, and complex carbohydrates begin breaking down into simple glucose for easy assimilation into the body. Bonus: this also helps prevent the annoying gas often associated with our lovely legumes! Before they will sprout, they need to soak. Place the seeds (nuts, grains, legumes) in a bowl and cover with lukewarm water. Soak times vary by species, but a good general guideline is 6-8 hours. It may be shorter for smaller seeds (like sesame and flax) and longer for harder ones (like rye, rice, or lentils). After seeds have soaked, remove them from their bath and gently rinse them in a colander or bowl. Place rinsed seeds in a dish or jar, and leave them be, uncovered. Most seeds sprout in 1-3 days. Quinoa seeds, soaked and rinsed and left to sprout. Like soak times, sprout times will vary by species. You should continue rinsing your seeds very carefully each day, until they begin to grow their tail. If you want a long tail, just continue to let them be. But if you want extend their life, you can refrigerate them to slow the growth. Either way, once the tail is sprouted they are ready to eat. The longer you wait, the more ‘watery’ and less flavorful they will be (in some cases, this is a good thing). Sprouts will keep for up to 5 days in the fridge. 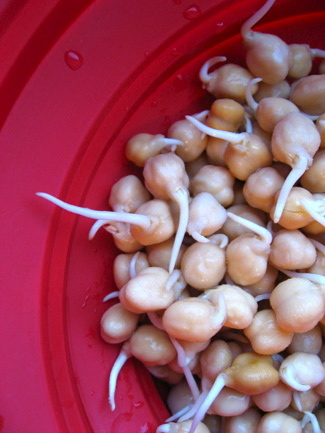 Sprouted chickpeas with long burly tails! Simple and helpful! Do you have any suggestions on eating sprouted lentils and almonds. I have a feeling I wont be able to stand eating sprouted lentils like one would pop candy. Im thinking blending them? Sprouted lentils sound to me like they’d be dreamy in a dehydro bread with chia seeds. I’ve got a giant bowl of various sproutable goodies from Sprout People. You’ve inspired me to pull some out tomorrow and see what’s what. The last time I got into sprouting big-time, I experimented with drying them up all crispy in the dehydrator and I thought they’d make some very good snacky recipes, with various spices. @ Stephanie – I love Angela’s idea of a lentil bread or cracker, if you have a dehydrator. If not, I think blending is a good idea. Maybe blending half with liquid and leaving half, and then mixing the two. Add some curry spice or cumin, tomatoes, and a raw mire poix, and you’ve got a hearty lentil soup. Or if you make it a bit thicker, a nice ‘bean’ dip. I really want to sprout some lentils, so I’ll let you know if I come up with anything good. John Hopkins Medical School has bred broccoli sprouts that are extra high in sulfurophane which fight cancer. They are patented and sold in supermarkets. So broccoli sprouts are toxic to cancer. Raw Chickpeas and other Legumes are known to cause lathyrism and they contain Protease inhibitors. I suggest you fully study which foods you can eat raw and which ones must be cooked to get rid of the toxins that can be very harmful or even deadly like sprouted sorghum, rutabagas and Cassava. It would not hurt to research mycotoxins and aflatoxins in grains and nuts either. @ Russ – Lathyrism is a disease caused by toxins in plants of the genus Lathyrus, most commonly the Grass pea. Chickpeas belong to the genus Cicer and are unrelated to lathyrism. 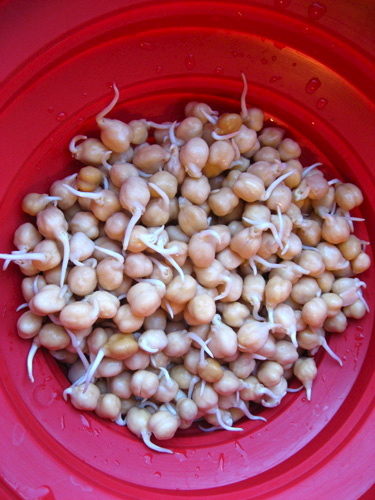 You can eat chickpeas raw off the vine, or dried and then soaked and sprouted, with absolutely no risk of lathyrism (or any other inherent disease). The peas that do belong to the genus Lathyrus are generally not considered edible – these are mostly ornamental peas. They are certainly not sold or eaten in ‘westernized’ countries. Unfortunately, cases of lathyrism are found in very impoverished regions of Africa and Asia where people are forced to eat these plants out of desperation. Mycotoxin is a catch-all term that just means ‘poison fungi’. Aflatoxins are a type of mycotoxins. Mycotoxins are not killed by cooking or by freezing, so eating raw sprouts would not carry any greater risk than eating the same foods cooked. I have researched mycotoxins and I am not concerned. Lathyrism a disease caused by eating seeds of species of Lathyrus (the grass pea), mainly L. sativus (the chick pea), L. cicera (flat-podded vetch) and L. clymenum (Spanish vetchling). It affects mostly people in Bangladesh, India, Pakistan, Nepal and Algeria but is sometimes found in France, Italy, Spain and Australia. This disease affects horses and cattle as well as in man. BOAA (beta-oxalyl-amino-L-alanine acid), an excitatory neurotoxin and glutamate agonist, has been identified as the constituent of the chickling pea responsible for the disease. Mycotoxins are natural metabolism products of moulds which can have a toxic effect on humans and animals; aflatoxins are the most toxic form of mycotoxins. Some types of food, such as dried fruit, spices and nuts, show an increased risk of aflatoxin release due to fungal infestation. As mycotoxins are temperature-resistant they are usually not destroyed when the food is processed. @ Russ – L. sativus is NOT the chickpea. It is the grass pea, also called the chickLING pea, a very different species. Chickpeas, aka garbanzo beans, are C. arietinum. I’m sorry, but you are confused on which species I was writing about. 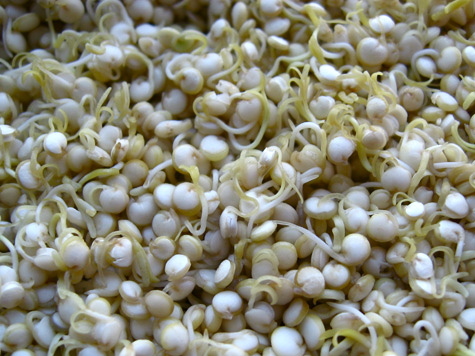 (Brown) lentil sprouts. You have two choices, long or short. If you grow them short you can use the crunchy sprouts in salads, grain breads, etc. Short takes about 2 days. If you grow them long you just harvest the shoot and discard the seed and root ball. Long sprouts take about 5 days and are useful in salads or as garnishes. I sprout all kinds of legumes, why the heck not? :-) Sprout green peas before making them into soup, pintos before making refried beans, etc. Lots of good stuff on this site, Sayward. Well done. Just found your site on Survival blog can’t wait to read the archives. Great ideas. I am trying a lot of things like canning for the first time too. Need skills if the tshtf. @ pamilea – Thanks, welcome to the site! 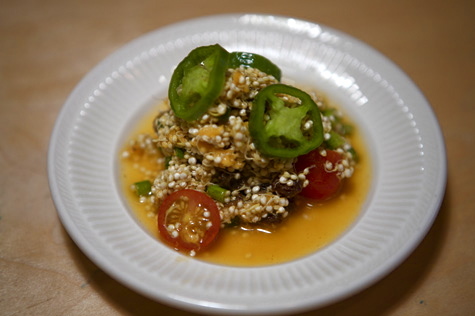 I am uncomfortable about research into mycotoxins found in many grains including Quinoa? Can I just say I love how educated you are? I love seeing you lay the smack down on silly nay-sayers. Plus it really helps to have a resource to go to when people start asking me questions about new foods I’m trying!! @ kory – Hah, thanks! HI! I’m a new-comer to the site. I’ve recently started sprouting different types of seeds. I have a special sprouting jar with holes in the lid which makes it easier to rinse the seeds and drain them. I do have 2 questions. 1: after a few days the sprouts start to grow little white hairs. What causes this, am I doing something wrong and if so, how do I prevent it from happening. 2: Once the sprouts are ready, I haven’t quite figured out how to keep them best. I tried on a plastic plate with plastic wrap over it, in a bowl with a lid, with no cover… etc. I always end up with something weird like mold or the sprouts dry out. I’d really appreciate the help! @ tandralee – What do you mean by “little white hairs”? Are you referring to the actual tail that comes out of the seed – ie the “sprout”? Or do you mean smaller hairs on the sprouts? If you mean smaller hairs, that sounds to me like mold. =( I would make sure you’re rinsing them very well, and that they’re not too warm. You may also want to cover the top with a rag or coffee filter, as it will let less dust/particles through than just the screen. If it keeps happening I’d look into a different seed supplier. Sprouts don’t last too long. They should work in a glass jar with a lid or in a plastic bag, in the fridge, for 2 days or so. It’s best to make smaller amounts and just always have them going, using them up as you resprout new ones, as opposed to trying to make a big batch all at once. Thanks Sayward. Yeah, I meant smaller hairs on the sprouts. Thanks for all the helpful suggestions. i was wondering how this method of sprouting compares with the other one you posted on soaking the seeds in water & an acid? i buy sprouts all the time & love them but never knew how to do my own! i cant wait to get started! i have a bunch of quinoa im going to try it out with! I know I’m a bit late here, so you may not get this comment or have a chance to respond, but my question is whether one would/could go on then to cook these sprouted beans or lentils or quinoa in order to eat them like “normal” cooked beans etc? Would that destroy the beneficial effects of the sprouting? Awesome – thank you! I’ll check out the follow-up, and I’m totally going to start doing this. YAAH! I have a question, hope its not too late to get it answered. 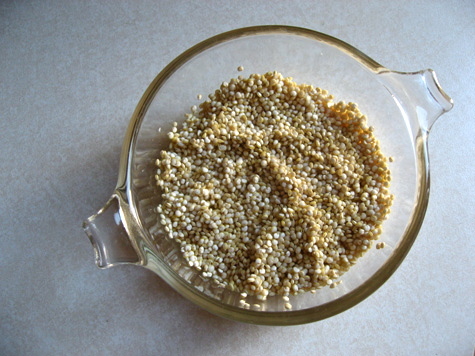 Could I soak and sprout, for example, my quinoa then dehydrate it and cook it later? That way I can do a huge amount each time? I am 99% sure this would work, although it would probably change the finished texture a bit. I’d start with a small batch first to test it out, before jumping into a bulk operation. I’d love to hear how it goes! Wait…so that means I could soak grains and then…make bread from them??? It destroys the enzymes and some of the nutrition depending on how its cooked. If you low heat them under around 118 degrees F for a long time you can get them “cooked” without destroying the enzymes.